I have totally convinced myself, eating healthy smaller meals of fresh grilled veggies and meat has been not only the way to eat very well, but very nutritious. I track my calories and this has been one of my favorites because of the simplicity of the food. I make brown or white rice using a small rice cooker. I like to keep this simple. If I want to add a little flavor, I might mix in onion, cayenne and a little lemon pepper to flavor the rice. I grill lean pieces of beef, strips of chicken breasts or fish. When I cook fish, I go with a white fish like tilapia. I like adding a little protein, I keep the marinades simple and add few spices. Everything else has spice in it, so don’t over do each item. Don’t worry about all the salt, add garlic, cayenne and pepper. Try lemon and herbs. The flavors will have you forgiving the absence of sodium in your meal. The less the better. I like whole black and pinto beans, as simple as they are – you can add protein and a whole lot of flavor to your meal simply by adding beans as another step. I like to then make Gallo Pinto, which is a dish made of rice and beans fried together with spices. It’s called different things in Central and South American, but it can be agreed thoughout – it’s delicious. I add in veggies. The typical fajitas include strips of sweet onions and colorful bell peppers (red, orange, yellow and green). The more unique veggies are then added if I have them, like zucchini, green chiles, plantains and sweet corn. Options are endless and keep the fajita diet fun for each night. Keep it simple with the tortillas. Don’t let half your meal’s calories go to the wrapper. Buy natural corn or carb light flour tortillas. 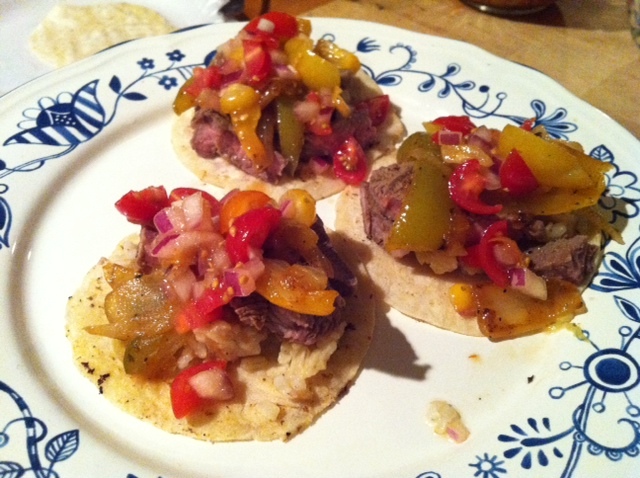 Make two or three small tacos for dinner with healthy portions of meat and veggies. I’ve been making fajitas during the week, it gets easier each night as you make your fresh salsa, rice and beans one night and have left overs.